I remember that back in the 1980’s, being hospitable meant having a tall glass filled with cigarettes on the table, next to a heavy table lighter and an ashtray. Visitors could take a cig and light right up: smoking was meant to be ‘cosy’, something to enjoy with friends. I don’t miss that (I’ve never smoked), and that’s not how we roll in our house. Instead, we have a little glass pot on top of a piece of rootwood, which we originally bought for a mini-flower arrangement. We filled it up with dice: many of the games we play at home (and that includes RPGs) use six-sided dice. So if you come over to play a game, you can select the dice you want to use! Seeing those dice brings back fond memories of my Magic the Gathering days, though if I remember those had 20 sides. In MtG, you have 20 life points. There are special dice to use as life-counters in MtG: normal 20-siders have the opposing sides sum up to 21 (so the 1 is opposite of the 20, the 11 to the 10 etc), but the life-counters have the consecutive numbers next to each other. These are all six siders though! I do have a dice bag full of polyhedrals, but those stay in the bag for easy transport when I'm playing somewhere else. That dice pot looks awesome! 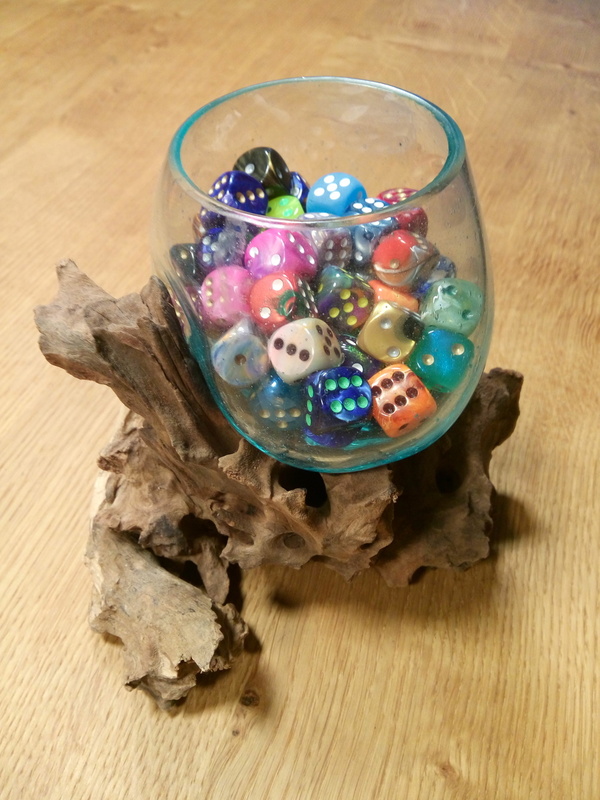 i like your dice idea! and i miss D&D. You should totally see if there's a game store with the D&D Adventure League going on. The organised play is all single-session, so there isn't even a long-term time commitment needed! thanks for the tip. i think i'd annoy everyone with my novice-ness though. i should definitely check it out then. I can remember my brother having those dice in the 80s.